Cetaceans are protected worldwide but vulnerable to incidental harm from an expanding array of human activities at sea. Managing potential hazards to these highly-mobile populations increasingly requires a detailed understanding of their seasonal distributions and habitats. 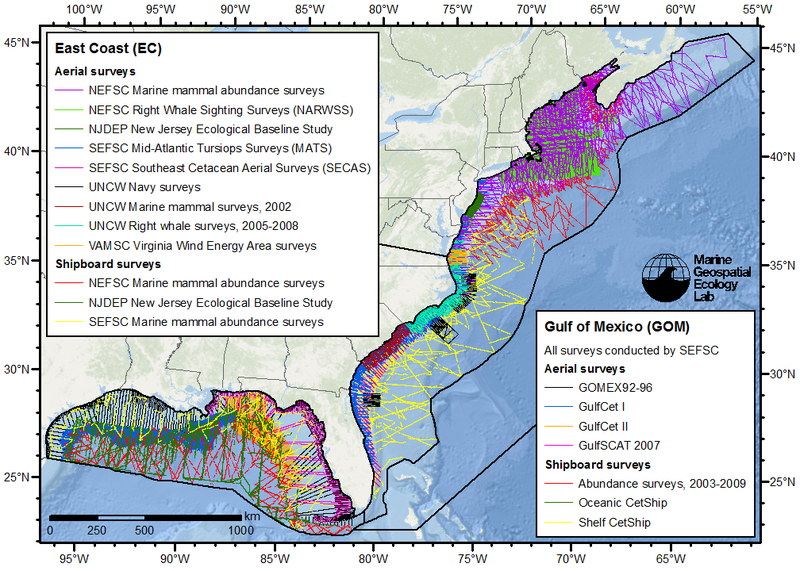 Pursuant to the urgent need for this knowledge in U.S. waters of the western North Atlantic and Gulf of Mexico, we integrated aerial and shipboard cetacean surveys conducted by five scientific organizations over 23 years and linked them to environmental data relating to cetacean habitat, such as sea surface temperature and chlorophyll concentration, obtained from satellite remote sensing and ocean models. Using distance sampling methodology, we built statistical models of cetacean density—the number of individual animals found per square kilometer of area—from environmental variables for 26 species and 3 multi-species guilds, and produced maps showing average density across the modeled region. Depending on the survey data that was available and how well each modeled taxon's movement patterns were described in the scientific literature, we produced either 12 monthly maps or one “year-round” map for each taxon. 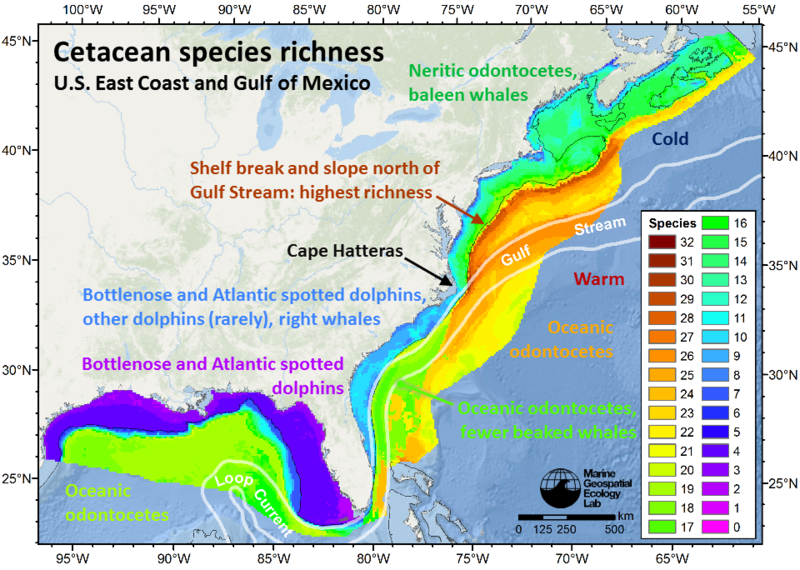 These are the first cetacean density maps for these regions to be published in the peer-reviewed literature. This website allows you to download the density maps for each taxon in GIS-compatible raster format along with maps that estimate the statistical uncertainty in the density estimates. Included with the maps are taxon-specific, region-specific reports that describe the modeling decisions made for each taxon, discuss the results, and provide diagnostic maps, plots, and statistical output. Do you find this project interesting? Share it with your friends! Here are some images suitably-sized for social media. Use your browser's "Save As" or "View Image" command to obtain full-size copies. All images above and animations below © 2015 by the Duke University Marine Geospatial Ecology Laboratory and licensed under a Creative Commons Attribution 4.0 International License. Download specific results below or all maps, animations, data, and supplemental reports together here: East Coast (EC) (1.63 GB), Gulf of Mexico (GOM) (340 MB). Animations are offered for the 11 east coast taxa we predicted at a monthly time step (see Frequently asked questions for discussion of seasonality). The altimeter products used in this analysis were produced by SSALTO/DUACS and distributed by AVISO, with support from CNES. Dudley Chelton, Michael Schlax, and colleagues contributed a database of geostrophic eddies detected in the AVISO data. Stéphane Maritorena and Erik Fields contributed satellite chlorophyll data from the Ocean Color MEaSUREs project. Patrick Lehodey, Beatriz Calmettes, and colleagues contributed zooplankton and micronekton results from the Spatial Ecosystem and Population Dynamics Model (SEAPODYM). Thanks to our colleagues for review and advice, especially Susan Barco, Elizabeth Becker, Danielle Cholewiak, Peter Corkeron, Andrew DiMatteo, Megan Ferguson, Karin Forney, Jim Hain, Jolie Harrison, Leila Hatch, Dave Johnston, Elizabeth Josephson, Erin LaBrecque, David L. Miller, Doug Nowacek, Joel Ortega-Ortiz, Richard Pace, Rui Prieto, Andy Read, Denise Risch, Jooke Robbins, Rob Schick, Doug Sigourney, Melissa Soldevilla, Joy Stanistreet, Len Thomas, Kim Urian, Sofie Van Parijs, Danielle Waples, and Simon Wood. Funding for this analysis was provided by the U.S. Navy Fleet Forces Command and by NASA (Grant/Cooperative Agreement Number NNX08AK73G). The Virginia Aquarium & Marine Science Center aerial surveys were funded by the Virginia Coastal Zone Management Program at the Department of Environmental Quality through Task 1 of Grant NA12NOS4190027 and Task 95.02 of Grant NA13NOS4190135 from NOAA, under the Coastal Zone Management Act of 1972, as amended. 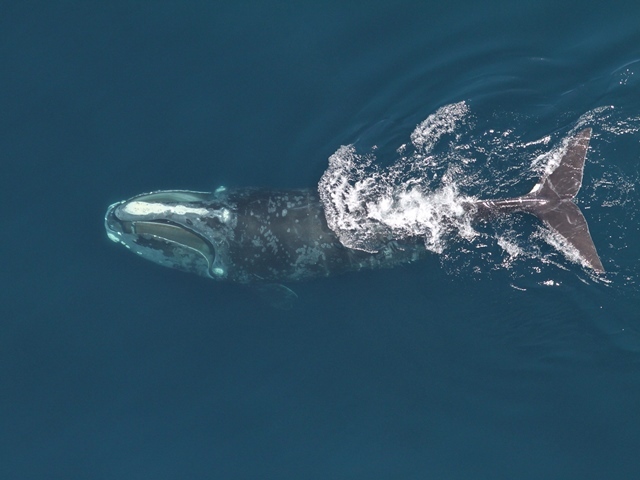 The NOAA Gulf of Mexico aerial and ship surveys were primarily conducted under inter-agency agreements between the NOAA Southeast Fisheries Science Center and BOEM Gulf of Mexico Region (numbers 16197, 1445-IA09-96-0009, and 15958). 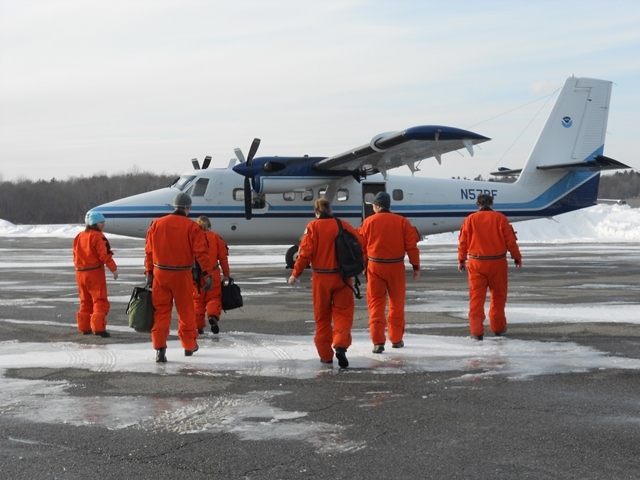 The University of North Carolina, Wilmington surveys were funded by U.S. Navy Fleet Forces Command with Joel Bell as the COTR, and by NOAA. As acknowledged above, U.S. Navy Fleet Forces Command was one of the funders of this modeling project. The Navy was given the opportunity to suggest spatial, temporal, and taxonomical resolutions and a geographic extent that would facilitate the Navy’s use of the results in U.S. environmental regulatory processes. When the analysis was complete, the Navy was given opportunity to view preliminary results. Neither the Navy nor any other funder participated in the analysis of the data or the preparation of the manuscript.